This year is the 100th anniversary of the disastrous conclusion to the Antarctic Expedition led by Robert Falcon Scott (1868-1912) in which he and his four companions died. Special commemorative events will be taking place in the UK and internationally, including a 4-month long exhibition starting on January 14th at the National Museum of Wales in Cardiff. Cardiff has been muscling in on Scott’s epic journey even before it started. It was Cardiff’s notoriously calculating shipowners and coal barons, ever on the look out for publicity and personal advancement, who promised to fill the coal bunkers of Scott’s ship the Terra Nova for free if he sailed from what was then the world’s busiest coal port. The marketing ploy worked and on June 15th 1910 the Terra Nova departed from Roath Basin for Cape Town (Scott went back to London to do more fund-raising, joining the Expedition later in South Africa). Solely because of this pretty minor connection, Cardiff has been fetishising Scott ever since. After the Terra Nova limped back into port from the calamitously inept venture in 1913 Cardiff was hitching itself to Scott in no time, erecting the ‘Scott Memorial’ lighthouse on Roath Park Lake in 1915 and installing a memorial tablet in the City Hall in 1916. That, you might think, would be memorials aplenty for what was after all a complete failure. But far from it; 100 years on Cardiff is awash with reminders of the snobbish, stubborn buffoon. We’ve got a whole neighbourhood, Scott Harbour, named after him; streets and buildings galore as well as three pubs (the Captain Scott, the Discovery and the Terra Nova) name-check Scott associations; there’s a ‘Scott Room’ and a blue plaque at the Royal Hotel where the Expedition members ate dinner before they headed south; the Captain Scott Society was founded in Cardiff in 1982 and still holds its meetings in the city; the binnacle (a special compass) of the Terra Nova is housed in the Pierhead Building; and, just in case saturation point had not yet been reached, in 2003 the ‘Scott Antarctic Memorial’ appeared on the waterfront at Cardiff Bay. Why this obsession? Scott’s home town (Plymouth), the home towns of the other deceased men (London, Cheltenham, Greenock and Rhosili), the base in New Zealand (Christchurch), the last port of call before Antarctica (Dunedin), the HQ of the Scott Polar Research Institute (Cambridge), the hut on Ross Island, the locations of their deaths on the Ross Ice Shelf, and the South Pole itself all have valid reasons to make much of their Scott links, but Cardiff’s small role hardly calls for such excessive over-egging. When one contrasts this to the total absence of so much as a single street name, let alone aggrandizing memorials, dedicated to any of the countless native Welsh heroes, poets, scholars and warriors who kept the flame of Wales alive for centuries and without whom Cardiff would be capital of bugger all, then this Scott fixation begins to look pathological – the over-compensatory fawning of the thoroughly subjugated to the presumed priorities of their masters. How embarassing. It wouldn’t be so bad if it worked, but there’s not a soul on Earth who thinks “Cardiff” when the name of Robert Scott is mentioned. And it would be a little less nauseating if Scott’s ridiculous jamboree was viewed with functioning critical faculties rather than with the sort of blinkered, jingoistic hero-worship that had been totally debunked and discredited as far back as the 1970s. Scott was always absolutely clear about the purpose of his ‘Race to the Pole’ against Norwegian Roald Amundsen (1872-1928): “..to secure for the British Empire the honour of this achievement”. The scientific enquiries that the forthcoming exhibition in Cardiff chooses to concentrate on came a distant second to territorial ambitions. 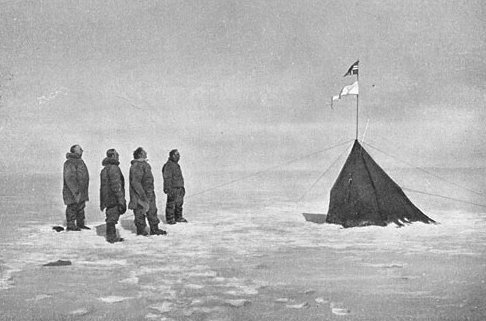 Ultimately, partly due to woefully amateurish preparations, partly due to a typically British/English overestimation of his own abilities, and partly due to the predictably dreadful weather, Scott was beaten to the South Pole by Amundsen. He, Edward Wilson (1872-1912), Lawrence ‘Titus’ Oates (1880-1912), Henry Bowers (1883-1912) and Welshman Edgar Evans (1876-1912) got there on January 17th 1912, 33 days after Amundsen’s team of five men. Little Norway, which had only recently gained independence from Sweden in 1905, basked in the “honour” and, as the pitiless Antarctic winds mocked the decline and fall of the British Empire, Scott and his men succumbed one by one on a nightmare trek back to base camp. Just three months later, the same combination of ice and arrogance would sink the “unsinkable” Titanic to complete a double nemesis that perfectly symbolised the crumbling of cold, cruel Britain’s delusions of grandeur. For the capital of Wales to strive so pathetically to associate itself with such a farcical British balls-up tells us all we need to know about Cardiff’s continuing abject status as the last outpost of Empire. And that’s why the key tasks in Cardiff today are to wrest control of the city from those who wish it to remain this piddling, provincial British nonentity, and to reach out for Cardiff’s manifest destiny as the true capital of an independent nation.